I know, I know, you're supposed to do these "best of the year" wrap-ups before the year actually ends. Well, I'm just glad we've made it through to 2018, so I'm not going to sweat the timing all that much. Looking back, it was a somewhat odd year of eating for me. We traveled – London, Paris, New York, Philadelphia, Chicago, Boston, San Francisco, Las Vegas, Santa Fe – but they were all mostly short jaunts, a few days here and there that were over almost as soon as they began. Meanwhile, I'm feeling increasingly out of touch with developments here at home; the list of new Miami restaurants I haven't yet tried grows longer and longer. Sometimes that's purposeful: just because it's new doesn't necessarily mean it's interesting or good. Sometimes it's geographically driven: one of the more interesting phenomena of the past year, to me anyway, is the abundance of independent restaurants opening outside of the usual trifecta of Wynwood, South Beach and Brickell. I'm thinking of places like Ghee in Downtown Dadeland, No Name Chinese and Shelley's in South Miami, Doce Provisions and Ella's Oyster Bar in Little Havana, Sherwood's Bistro in Little Haiti, Finka Table and Tap and Amelia's 1931 out west. Some of those are easier for me to get to than others, but those I've gotten to have provided some of the most interesting eating of the past year. And sometimes, let's be honest, inertia sets in. As always, despite that word "best," I make no pretense of this being any sort of objective listing, only my personal favorites of the places I had the good fortune to visit in 2017. They are not ranked, but rather are listed here in roughly chronological order. For ease of digestion, I'll be breaking this up into three parts. I wasn't sure Miami needed a second Bazaar restaurant from Chef José Andrés, but I'm glad we got another, and the seafood-focused menu at Bazaar Mar is sufficiently different from the original that they're both worthy of a visit (you can read my thoughts and see more pictures in this Bazaar Mar flickr set). There are lots of flashy, showy dishes there, but one of my favorites was one of the simplest. 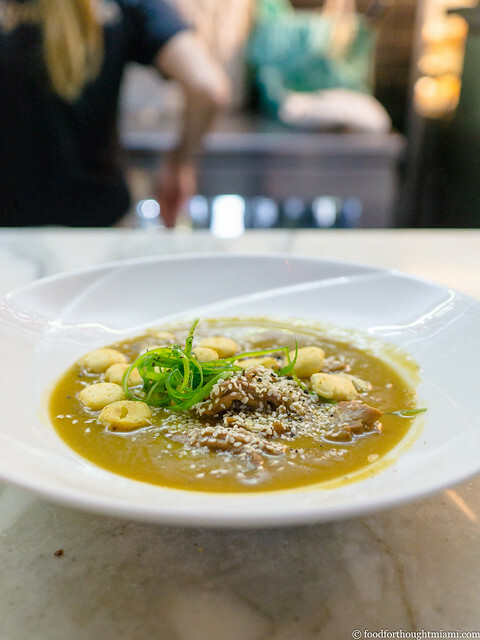 The larger dishes on the menu tend to skew a bit more traditional, but that doesn't necessarily mean boring. I loved these little cockles, fresh from the tank, in a Basque-style pil pil sauce, an emulsion of garlic, parsley, olive oil and fish juices. José Andrés' accomplishments this past year far transcend the restaurant world: through World Central Kitchen, he delivered over two million meals to over seventy locations in Puerto Rico after Hurricane Maria devastated the island. He also continues to run restaurants that make some great food. José for President! Chef Niven Patel of Ghee is making some of the most exciting food in Miami right now, and over the past year he's gone from doing pop-ups at his home in Homestead to opening two restaurants featuring his version of farm-to-table Indian cuisine. We got a taste back in March, shortly before his first spot in Downtown Dadeland opened (read my thoughts on our Cobaya Rancho Patel dinner and see more pictures in this Cobaya Rancho Patel flickr set). 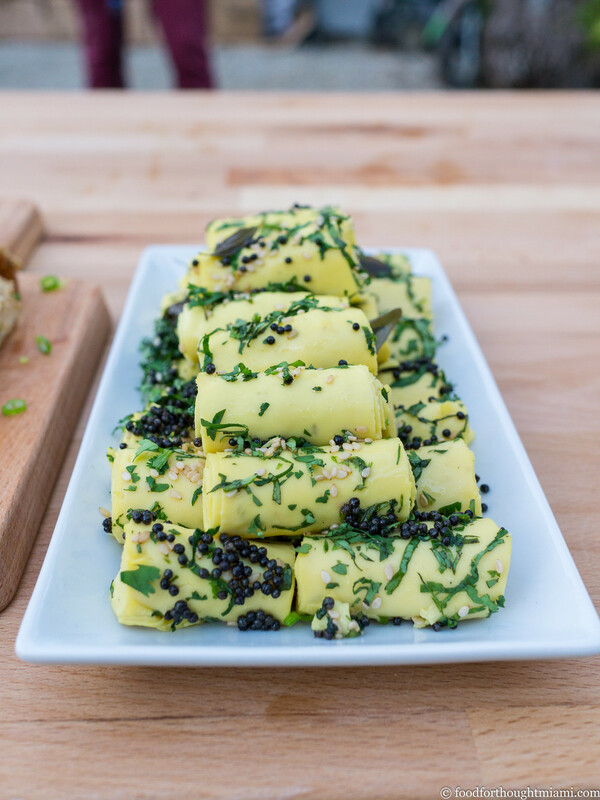 A special treat: khandvi, or as our menu called them, "chickpea roll-ups." This was something I'd never tried before, and for good reason: Niven says you're unlikely to ever see these unless your mother or grandmother is making them, as getting the batter – a mixture of chickpea flour and yogurt or buttermilk – and texture right is a bit of alchemy that could keep molecular gastronomists busy for a while. I was glad someone knew how to do it: these light, fluffy crepes, reminiscent of Japanese tamagoyaki, and seasoned with toasted black mustard seeds, julienned cilantro and curry leaf, were absolutely delicious. February featured a whirlwind trip to London and Paris, three days in each, which included a visit to one of the culinary stations of the cross: Fergus Henderson's St. John restaurant (actually, its sibling, St. John Bread and Wine in Spitalfields) (read my thoughts and see more pictures in this St. John Bread and Wine flickr set). "Do you recall eating Raisin Bran for breakfast? The raisin-to-bran-flake ratio was always a huge anxiety, to a point, sometimes, that one was tempted to add extra raisins, which inevitably resulted in too many raisins, and one lost that pleasure of discovering the occasional sweet chewiness in contrast to the branny crunch. When administering such things as capers, it is very good to remember Raisin Bran." Our dinner at The Clove Club, chef Isaac McHale's all-grown-up supper club in Shoreditch, was one of my favorites of the year; two dishes from that meal appear here (read my thoughts and see more pictures in this Clove Club flickr set). In "The Physiology of Taste," Brillat-Savarin famously wrote, "The discovery of a new dish confers more happiness on humanity than the discovery of a new star." 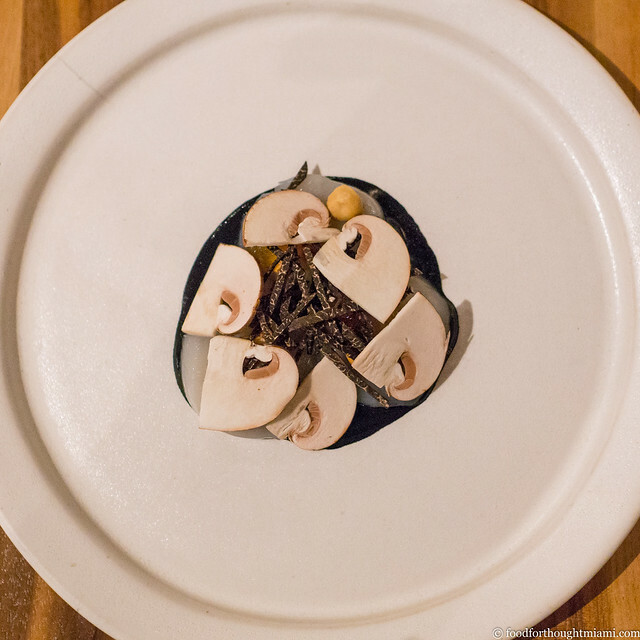 I can't say for certain that this is an entirely new dish; I can say it's the first time I've had this particular combination of raw scallop, slivered raw button mushrooms, crushed hazelnuts, clementine and black truffle, all assembled over a jet-black squid ink purée. The scallop itself – from fisheries in Orkney, in the outer northern reaches of Scotland – is beautifully plump and fresh and sweet. It's complemented by a fascinating interplay of earthy and nutty flavors, brightened just a hint by the citrus. Speaking for myself, anyway, it's a lot more exciting than the latest "cold brown dwarf." Tasting menus often tend to peter out (for me anyway) as you approach the "big protein" stage, with creativity and finesse giving way to a push for satiety. Not here. 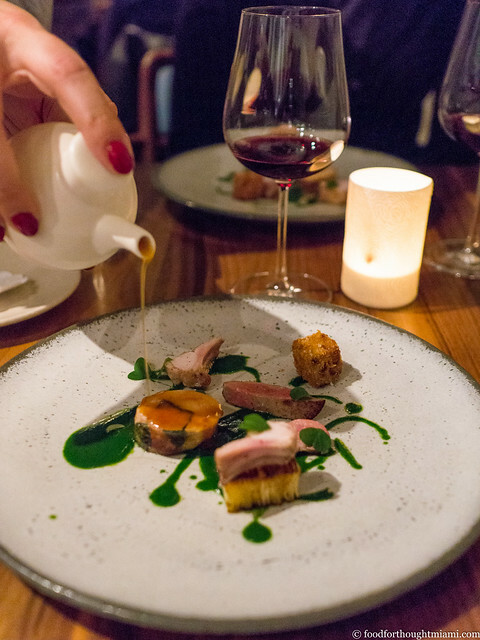 This rabbit dish is a tour de force, making use of all the animal in a variety of ways – a ballotine threaded with green leaves, a pinkish slice of loin, tiny chops from the ribs, a wee rabbit heart, a cromesqui of offal, pulled together with a bright green herb sauce redolent with tarragon, then finally drizzled tableside with a rabbit broth. Fantastic. 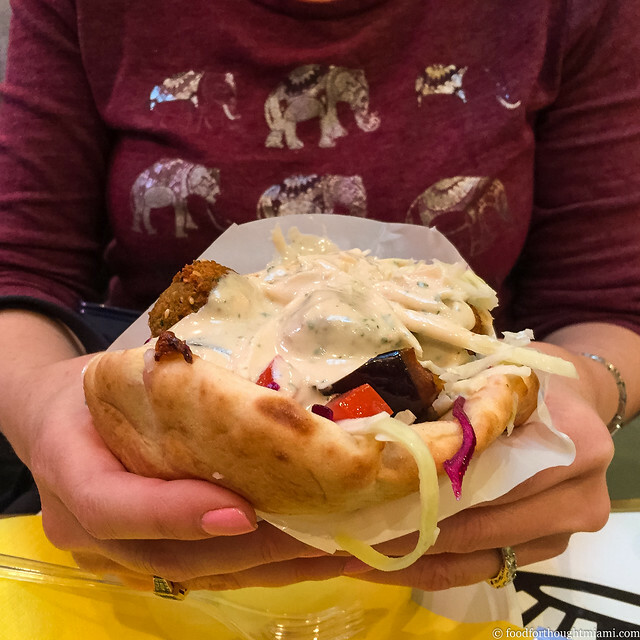 As unlikely as it may sound, possibly the best thing we ate over three quick days in Paris was the falafel sandwich at L'As du Fallafel, in the historically Jewish Marais district. Crisp, fluffy chickpea fritters, slippery fried eggplant, crunchy, sharp pickles, spicy harissa, a tidal wave of herb-flecked tehina sauce – this is the platonic ideal of falafel sandwiches. One of several great meals I never got around to writing about was at Paris' Clown Bar (see more pictures in this Clown Bar flickr set). A few months before our visit, Eater critic Ryan Sutton named it "the most thrilling restaurant in Paris." We were not able to do a sufficiently comprehensive comparison in three days to test that assertion, but I get what he's talking about. 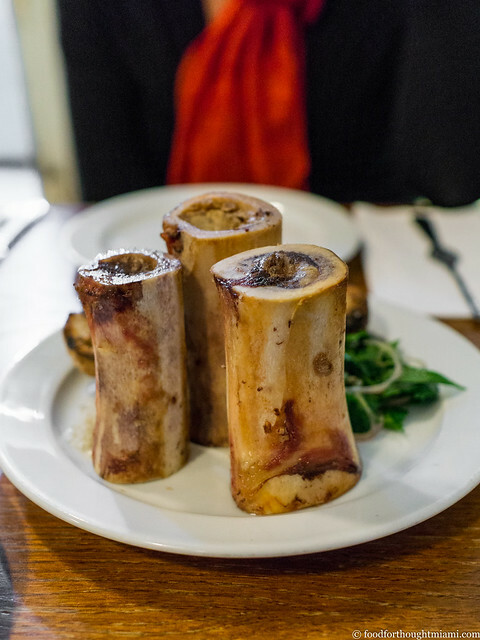 We ate delicious razor clams smothered in slivered leeks and melting bone marrow, and a rich pithivier filled with duck forcemeat, rosy breast, and foie gras. 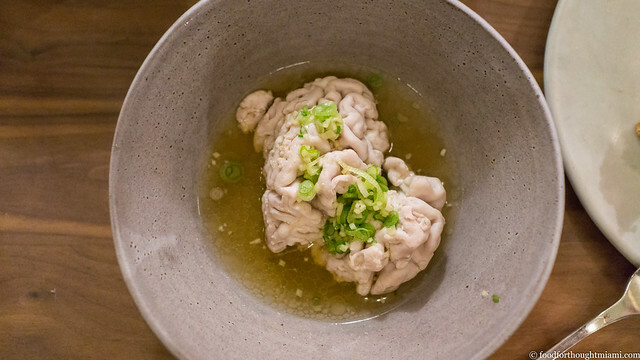 But my favorite was the poached veal brain, unmistakably exactly what it was advertised to be, swimming in a tosazu vinaigrette, its acidic edge rounded with soy and dashi flavors. 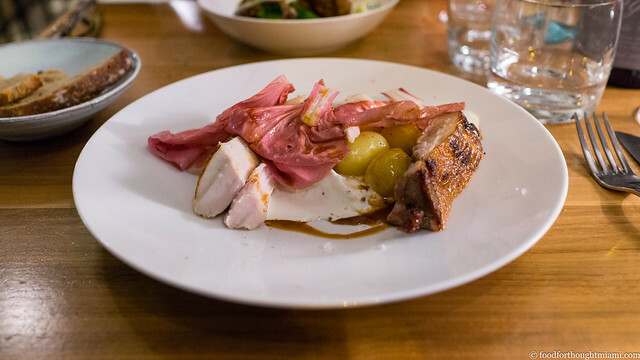 Reading this item on the menu at Le Servan, chef Tatiana Levha's bistro in the 11th Arrondissement, nothing about it made sense: chicken, potatoes, radicchio, burrata? On the plate, it was a different story. It sounds odd to be excited about chicken that tastes like chicken, and potatoes that taste like potatoes. But, after eating so many bland, tasteless examples of both, the fact that these tasted so vividly and eloquently of themselves – the chicken crisp-skinned but juicy, nearly blushing pink, the young new potatoes earthy and fresh – was something genuinely special, and in combination with the bitter, crunchy radicchio and the creamy, runny cheese, came together like magic. For the third year, our Cobaya dinner group did an event in collaboration with the South Beach Wine and Food Festival. This time, we paired up with Alter's Brad Kilgore, and Jeremiah Stone and Fabian Von Hauske of New York's Contra and Wildair, with Jean-Luc Royere of the Mandarin Oriental playing host (you can read my thoughts on the dinner and see more pictures in this Cobaya SOBEWFF 2017 flickr set). Brad followed with a super-soigne version of an izakaya staple: kama, or fish collar. Here, he used kanpachi, a smaller variety of amberjack, which he smoked and flavored with koji miso (Brad told me it was quite a process to gather enough collars for the 80+ covers at our dinner). The collar meat may be the most lush and fatty on the fish, and here it came out all supple and silky, like a cross between smoked sable and Nobu's famous miso cod. 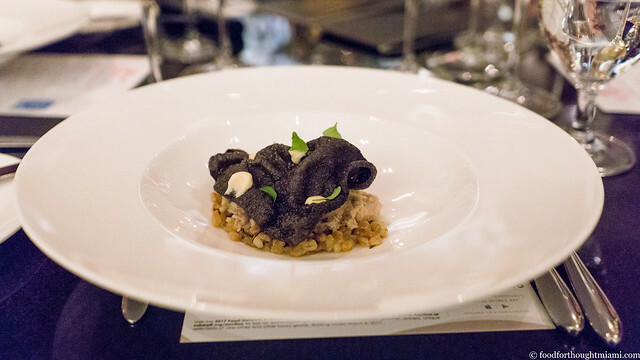 Even better, he topped each plate with a big, puffy black truffle cracker, made with tapioca and a pound of Urbani truffles. I was dubious that the flavor would carry through in that format, but I guess it works out just fine if you use enough truffles. It was a great dish. The restaurant business always has high turnover, and I know that, but I still get my heart broken sometimes. There were a couple of those this year. When I heard that Daniel Serfer was taking over the old Gourmet Diner spot on Biscayne Boulevard in North Miami to open another Mignonette, I was pretty excited (read my thoughts and see more pictures in this Mignonette Uptown flickr set). I was already a fan of the original Mignonette downtown, and this meant I'd have one within ten miles north as well as ten miles south of home. Plus, we had been regulars at Gourmet Diner for a long time, and the old aluminum diner held lots of good memories for us. 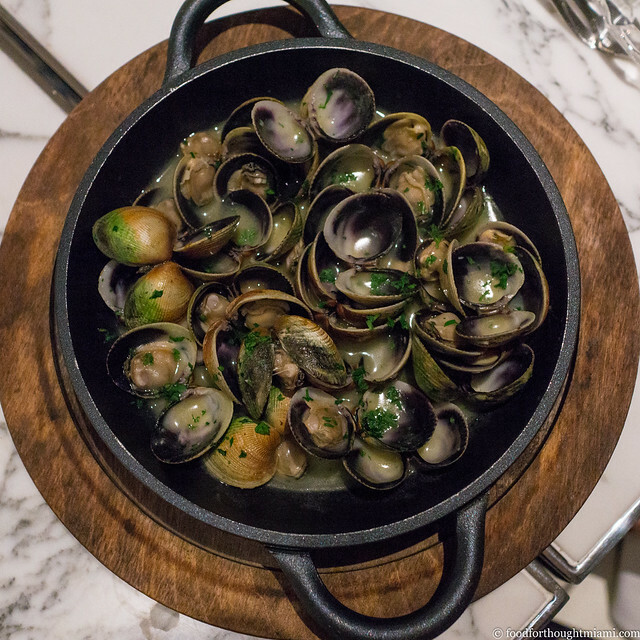 Alas, it was not meant to be – Mignonette Uptown closed a few weeks ago. So I'll have some new memories from Mignonette Uptown's brief tenure to add to those of Gourmet Diner, including this homely looking but delicious brown oyster stew, a hearty, pork-supplemented umami bomb thickened with a bennecake flour roux and lifted with a splash of lemon juice. (Serfer readily acknowledged the recipe was lifted from Sean Brock's book "Heritage"). 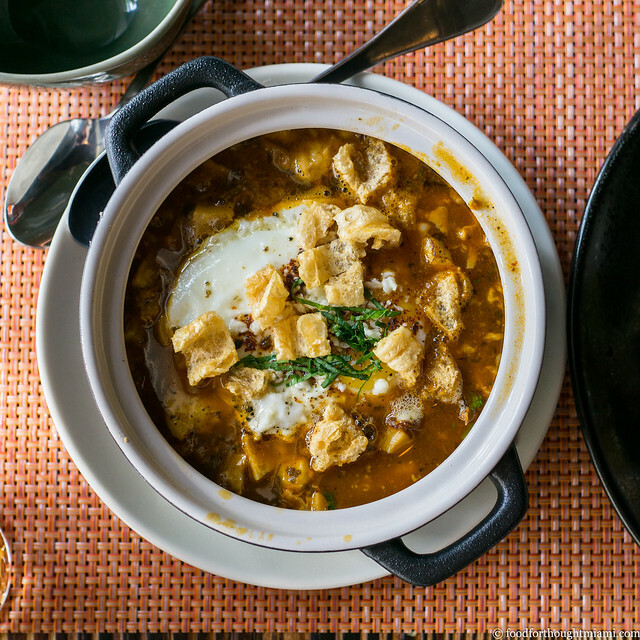 Chef Scott Linquist's Olla was another of those heartbreakers. His contemporary Mexican restaurant on the west end of Lincoln Road in Miami Beach quickly became a favorite of mine after opening in late 2016 (read my thoughts and see more pictures in this Olla Miami flickr set). But that market apparently preferred the Rosa Mexicano across the street. I'm glad we got a chance to do a Cobaya dinner there before it closed (more thoughts on our Cobaya dinner, and more pics in this Cobaya Olla flickr set), as that meal supplied two of my favorite dishes of the year. Either of the two next items – in a round Linquist called "Pato y Patas" – could also have been my dish of the night. 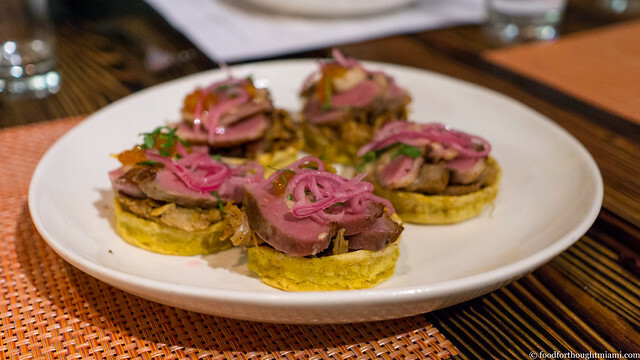 For the "pato," he did a sope of duck three ways – the breast cured and seared, the leg cooked in its own fat like carnitas, a mousse of foie gras for the base – all served on a puck of masa, and garnished with a mole coloradito, more of that pasilla Oaxaca, and a kumquat marmelada. It was excellent. The "patas" element was also a variation on a regular menu item, Olla's excellent menudo. The rich broth is made with three different patas (feet) – I'm guessing pork trotters, cow foot and chicken feet – and has a beautiful, gelatinous stickiness like a good tonkotsu ramen broth. It's warmed with guajillo chiles, studded with bits of pork and slippery, silky tripe, and topped with a sunny side up egg and Mexican oregano. I absolutely love it. Stay tuned for Part 2, now posted, and Part 3, also now posted.